Rich-and-creamy Vegan Queso is also sneakily pretty healthy. And you make it right in your blender! This is sort of an old-school vegan queso recipe, and it’s still one of my favorites. A classic! This vegan queso recipe is kid-tested and omnivore approved. I’ve served it to vegans and non-vegans, toddlers, older kids, and adults. Everyone devours it. It’s rich, creamy, and tastes decadently delicious. When I first started making this vegan queso recipe back in 2011, it was kind of a revelation. At the time, commercially-available vegan cheeses only vaguely resembled cheese. This was before Chao and Follow Your Heart Slices hit the shelves and before Miyoko Schinner’s Artisan Vegan Cheese changed the game. One of the most common comments I get from non-vegans is that they couldn’t live without cheese. Seriously, I can almost tell by the look on a person’s face at this point that they’re about to confess their cheesy devotion. I’m not complaining here. 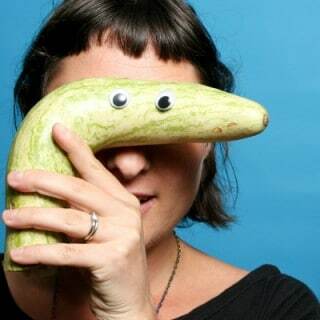 Just observing. Because I was a die-hard cheese-eater, too. Giving up cheese was harder for me than giving up smoking. It was also one of the best things I think I’ve ever done for my health, and I’d do it again in a heartbeat. While store-bought vegan cheeses have come a long way, I still make this vegan queso recipe quite a bit. It’s affordable, easy, and uses all natural ingredients. My favorite things! 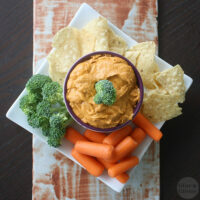 Even my omnivore friends devour this vegan queso dip when I make it, and I thought you guys might like to try it, too, since it’s so quick and simple to make! Of course, you can dish this up with chips and veggies for dipping, as pictured, but this vegan cheese recipe is way more versatile than that. Use dollops of it on pizza, spread it onto sandwiches, or stuff it into a pita or wrap. You can also spread it onto bread and fry that baby up for a vegan grilled cheese. I love it in tacos or on top of a burrito bowl, too. Basically, anywhere you feel like your food could use some cheesy goodness, this vegan queso is your friend. 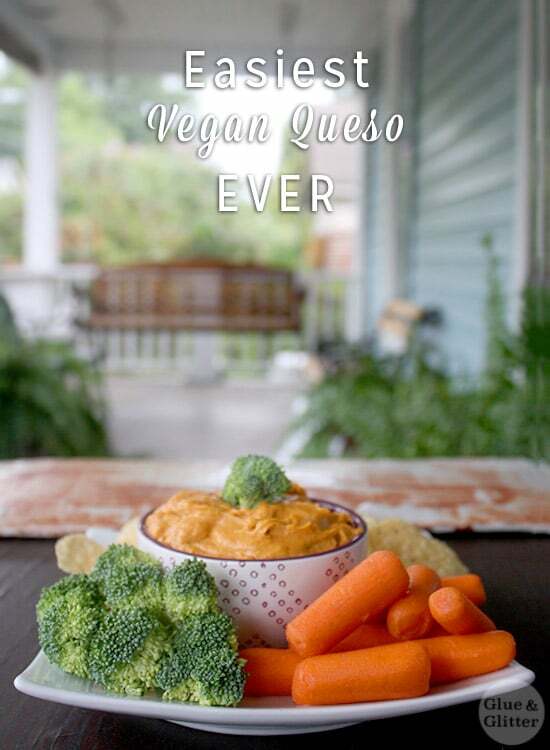 This vegan queso recipe will keep in the fridge nicely for two to three days, so it’s a great make-ahead recipe for parties! 1/2 cup salsa - Choose your favorite! Toss all of the ingredients into the blender, and puree until smooth. Then, blend for a little bit longer. Then, just for good measure, blend for just 30 more seconds. Serve with chips, crackers, or veggies for dipping. You can also drizzle over tortilla chips for some impromptu nachos! I so know what you mean about the cheese…. I currently eat 2 vegetarian meals/wk, all the rest of my meals are vegan just because of cheese. But I am getting closer heading for 1/wk. This recipe will help me get there…. Looks delicious!! I am so thrilled to hear it! Glad that this will help! Thank you, Sarah! The salsa really makes it extra special. I brought this batch over to my omni neighbor’s house, and even her two year old asked for more. Hurrah for queso! Boy that looks good, a perfect snack! Thanks for sharing with us at #TryaBiteTuesday – pinned & tweeted to share the love! Hope to see you back next week! Thank you, Debra! Loving your linkup! ?? Sounds great! I can never have too many queso recipes. Thank you, Cadry! I agree. Queso forever!